The OBA is set to hold their Leadership Elections tomorrow evening [Nov 18], with Jeanne Atherden, Craig Cannonier, and Patricia Gordon-Pamplin standing for OBA Leader, while Leah Scott is the sole candidate for Deputy Leader. 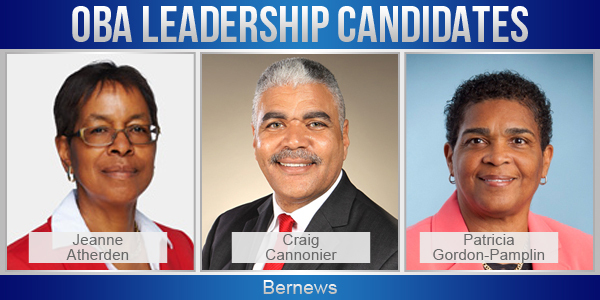 This leadership election comes after former OBA Leader Michael Dunkley resigned as Party Leader in July following their loss in the General Election, with Patricia Gordon-Pamplin subsequently named the interim Party Leader. Ms Atherden, Mr Cannonier, and Ms Gordon-Pamplin all served as Cabinet Ministers when the OBA was in power, and Mr Cannonier previously served as the OBA Leader, and Premier, before stepping down in May 2014 amidst the ‘JetGate’ controversy. In addition to OBA Party Leader and Deputy Leader, the OBA will also hold elections for Party Chairperson and two Party Deputy Co-Chairpersons positions on Saturday evening. The thing about politicians is that that they ALL have agendas. When dealing with the PEOPLE’S MONEY you look for a politician who will give you the best return on your taxes with the least amount of agendas to complicate things and waste your hard earned dollars. Government use YOUR money. It’s not THEIR money! Why do the surrogates always stick their necks out first? Clearly tactical, its like opening with your best batsman, you don’t do it. See off the new ball, watch the PLP make a mess of things, bring in Jeff Baron. Its why its called politics folks. I hope you finally allow the media to take pictures of who this organisation really is. Instead of hiding your real supporters from the Bermuda Voters. It sad that a group that claims to be so diverse refuses to allow the media at any of their functions. This is unbelievable. A Premier that resigned in disgrace is actually contesting to become leader again. A Deputy leader who is arguably the most toxic and vile speaker at times. And a third option who no one pays any mind to or has any charisma to lead the party. Their options are few. This is sad. Well, the only proven election winner is Cannonier. Let’s hope he isn’t thrown under a bus a second time. He was not thrown under the bus. In my opinion not only should be not run for leadership again, but he should not even be an MP. There are still so many unanswered questions, like why was there a member of the public (with ties to Craig) participating in Government meetings? Why did the Premier and Ministers fly on a private jet with him and why were there not permanent secretaries with them? NO! There are too many questionable activities to allow Craig to return as leader. He should resign as an MP. EB did the same but you didn’t kick $%#& then…why not?! You might start with why the OBA kicked Craig’s A$$$ to the curb when he was leader and gave it to the Milkman/worst leader in history! The Return of the Surrogate. CC want the political party he created back’. – they don’t seem to be a very effective opposition anyway. Well with this generous gesture that the Government gave the teachers, they will be in for a while. Any idiot can be “generous” if they’re using other people’s money. You lot are just a bunch of suckers. Someone gives you trinkets, you lap it up. If this is the best they have to offer heaven help us. Cannonier is most definitely the strongest candidate. The other two….well one of them seems to know how to divide people very well and the other one well I have to tap her to see if she is awake half of the time because she lacks emotion and any resemblance of a personality. Cannonier has too much political baggage! the worst line up ever, pop the champagne PLP 5 more terms for you! This is just so sad. Until the bye-elections to replace Moniz, Dunkley, Gibbons, Pat and Jeanne, these guys have absolutely no hope of winning an election. The OBA is on life-support and whatever “leader” they choose of these three will not cancel out the true leadership of their alliance. One need only see how infrequently most of their MPs attend the House to prove how disengaged and uninterested they are in the process. It’s over and only a miracle will make them electable. Hard to drive forward looking in the rear view mirror. Oh No! Not him again!!! First consider changing the party name back to UBP , then , put a Front Street guy in charge .